Al Faro Cosmio Hotel, D’Pearl Bay, Coron; +63 920 294 9138; www.alfaropalawan.com. Luxuriate in the comfort of a bungalow suite, which boasts gorgeous views of the sea. Asia Grand View Hotel, Governor’s Ave, Jolo, Brgy. Poblacion 5, Coron; asiagrandview.com. An elegant resort with décor inspired by contemporary Asian art. Busuanga Seadive Resort, Don Pedro St, Coron; +63 917 808 6697; www.seadiveresort.com. Each room boasts ensuite bath and shower facilities. The resort also organizes diving excursions and other tours. Casa Montemar Bed and Breakfast, Nueva St, Brgy. Poblacion 5, Coron; +63 908 3497378; casamontemarpalawan.com. A comfy, value-for-money B&B perched at the top of a hill. Coron Village Lodge, Busuanga Rd, Coron; +63 928 202 0819; www.coronvillagelodge.com. A homely, affordable hotel that also tailors tour packages for guests. Micasa Lodge, National Highway, Brgy. Poblacion 1, Coron; +63 2 404.4784; www.micasalodgecoron.com. Strategically located just 20 minutes from the Francisco B. Reyes Airport. Sunz en Coron, Brgy. Poblacion 6, Coron; +63 915 901 2642; www.sunzencoron.ph. A pleasant Korean-owned resort located on the outskirts of Coron town. The Funny Lion, Sitio Jolo, Brgy. Poblacion 5, Coron; +63 2 553 9549; thefunnylion.com. A clean and contemporary boutique hotel with awesome sunset views of Coron Bay. Al Faro Restaurant and Bar, D’Pearl Bay, Coron; +63 920 294 9138; www.alfaropalawan.com. Try local fare like chicken adobo (chicken stewed in vinegar and soy sauce) and rock lobster. There are also international dishes available, such as paella and risotto. Bayview Bar & Restaurant, Asia Grand View Hotel, Governor’s Ave, Jolo, Brgy. 5, Coron; +63 48 788 3385; asiagrandview.com. A family-friendly restaurant offering lovely views of Coron Bay. Big Mama’s Pinoy Hot Pot & Grill, National Highway, Brgy. Poblacion 4, Coron. Besides sampling a la carte dishes from the menu, you can also order raw seafood, marinated pork and chicken and have them cooked any way you like. Bistro Coron, National Highway, Brgy. Poblacion 4, Coron; +63 918 305 0750. Serves pizza, pasta, sandwiches and continental cuisine. Coffee Kong, National Highway, Brgy. 5, Coron. A pleasant coffee joint serving up freshly brewed coffee at friendly prices. Food Trip, Coron. This 24-hour eatery near the Coron Public Market is perfect for a late-night supper run! Kaison Restaurant, National Highway, Coron. Buy fresh seafood at the talipapa (wet market) and bring it to this restaurant. The chefs can cook it any way you like for a fee of just PHP150 per kilo. Kawayanan Grill, Busuanga Rd, Coron; +63 917 805 0954; www.kawayanangrill.com. Must-tries here include the seafood platter with pack (wild fern) salad (good for up to three people) and crocodile sisig (meat marinated in vinegar). La Sirenetta Seafood Restaurant & Bar, Real St, Coron. A quiet and romantic restaurant with great sunset views. Try the adobo (chicken stewed in vinegar and soy sauce) fried rice. Lobster King, National Highway, Brgy. Poblacion 5, Coron. Get your lobster fix here. The lobsters are fresh and delicious, and cost roughly PHP1,000 for four pieces. Lolo Nonoy’s, National Nighway, Brgy. Poblacion 3, Coron. Your go-to place for a night out with friends, with large serving sizes ideal for sharing. Santino’s Grill, Coron-Busuanga Rd; +63 915 700 3881. Try the baby back ribs — the tender meat slides right off the bone. There are seafood options available, too. Seafront Restaurant and Bar, Busuanga Seadive Resort, Don Pedro St, Coron; +63 917 808 6697; www.seadiveresort.com. Enjoy a sumptuous seafood spread while enjoying stunning views of the sea and nearby islands. Sinugba sa Balay, San Agustin St, Coron. The restaurant’s catch-of-the-day sometimes features an entire whole grilled saltwater salmon, for a mere PHP200. Calauit Safari Park, Calauit Island. A game reserve and wildlife park located in a 3,700-hectare island off the coast of Palawan. In the 1970s, giraffes, zebras, and other wildlife were brought by barge from Kenya to the island. Calumbuyan Island. Go snorkeling at this privately-owned island, and get up close and personal with a fascinating array of marine life. Kayangan Lake, Coron. 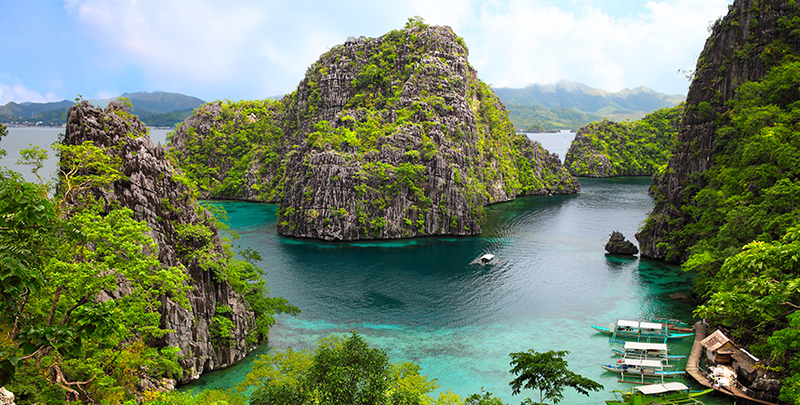 Undoubtedly one of the top attractions in Coron, it is said to be the cleanest lake in the Philippines. Take a short hike to the top of the hill, where you can get a picture-perfect view of the lake. Malcapuya Island. Take a 1.5-hour boat ride from Coron town to this quiet island, which boasts a beautiful white-sand beach with clear, shallow waters. Maquinit Hot Springs, Coron. Take a therapeutic dip in the warm waters of the springs. Contact Coron Galeri (www.corongaleri.com.ph) for affordable tours and island hopping rates. Mount Tapyas, Coron. It’ll take you 740 steps to hike up the mountain, but the beautiful views from the summit will be well worth the effort! Siete Pecados, Coron. Another beautiful spot for snorkelling, with an abundance of untouched coral. Twin Lagoons, Coron. Marvel at the majestic limestone formations and crystal-clear waters of the lagoons. You can also swim under the caves to get from one lagoon to the other.